You don't need machines at the gym to get fit. Your own body weight and gravity can do the job, and you'll work them with these 15 moves. Not active now? Check in with your doctor first, and if something hurts, stop. You're on your way to getting into your best shape! Your whole upper body gets a muscle-ripping workout here, including the abs. Start with feet hip-width apart, knees slightly bent. Attach a band overhead and grab it over the shoulder, trunk angled toward the band. Pull down to the opposite hip, rotating slightly. Slowly return. This move hits all the muscles used in a pull-up, as well as all your core muscles. Grasp the handles with straight arms and tubing taut. Pull the handles towards you and lean back a little. Focus on bringing your shoulder blades back and together. Pause and slowly straighten arms back to the starting position without bending forward. For safety reasons, do not lean back. Should the band break or come loose, there is high risk of fall. 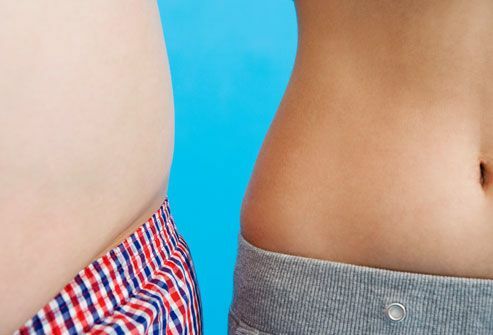 Want to burn fat quickly? Rapid-fire circuits turn strength moves into calorie-torching, cardio work. "If your goal is weight loss, use light weights and low reps," says exercise physiologist Pete McCall, of the American Council on Exercise. A circuit may include push-ups, pull-ups, and crunches followed by a two-minute run. Repeat or alternate with another circuit of biceps curls, dips, and shoulder presses to target smaller muscles. 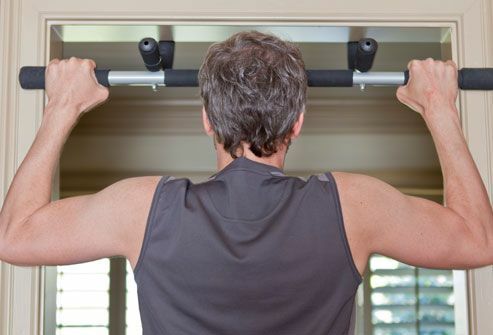 Pull-ups work arm and back muscles, giving you great bang for your buck. Having the palms facing you works not just the back, but also targets the biceps. Grasp the chin-up bar and cross your legs to keep the lower body stable. Slowly pull your body up, bending your elbows, until your chin is level with the bar. Pause, then slowly return to your starting position. Repeat. A wide grip makes the chest muscles work a little harder. Place your hands outside the shoulders. You should engage your core, thigh, and glutes to get the most out of this or any push-up. As you lift, "Think about gripping the ground with your hands to engage the large muscles of the pectoralis major," McCall says. 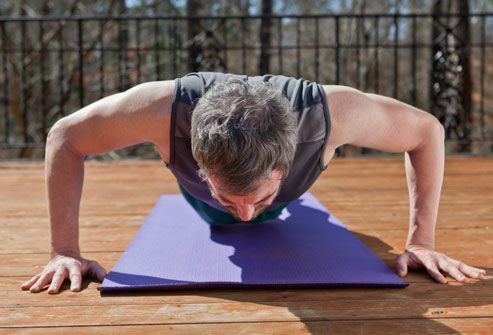 This challenging push-up can kick your shoulder strength up a couple notches. Get into a standard push-up: hands a little wider than shoulder-width apart, fingers facing forward, elbows slightly bent, and eyes on the floor. Then place feet behind you on a stair, chair, or bench. Keep your body in a straight line, engage the abs, bend your elbows, and lower your chest towards the floor. Push back to starting position. Pro athletes train with jumping jacks and other explosive moves to increase muscle power. 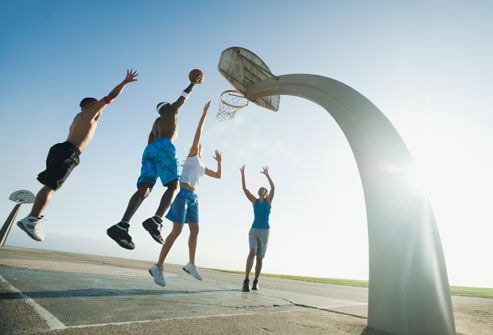 It helps basketball players jump higher and tennis players get to the ball faster. Jump training is also called plyometrics, and it's not for beginners or for those with joint issues. But if you have good strength and balance, it can ramp up your game. 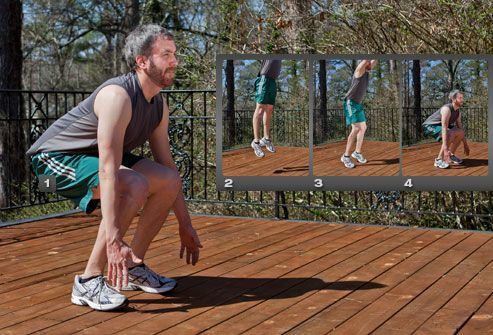 Try adding plyometric moves to your workout once or twice a week. Shift your hips back and down until your heels start to lift off the floor. Explode up, swinging the arms overhead as you straighten your legs. Create a straight line from toes to fingers, with your back flat. Land softly on the middle of your foot and sink back into a squat to help absorb the impact. Try this advanced move on grass or another soft surface. 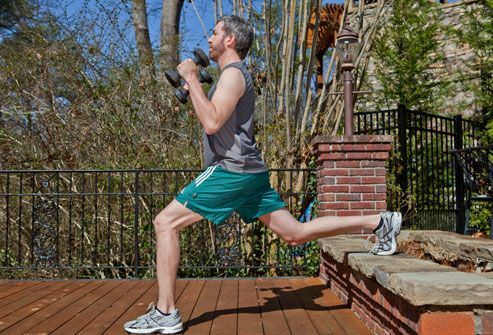 Sink into a lunge position with left leg forward, right leg back, and both knees bent to 90 degrees. Swing your arms behind you for greater power as you jump up, using your arms to assist as needed. Keep your back straight, eyes facing forward, and use your abs. Switch legs in the air and land softly, returning to the lunge position. Rest after each set. To lose belly fat, you'll want a full-body exercise routine that builds lean muscle all over. Muscle burns calories, even at rest. 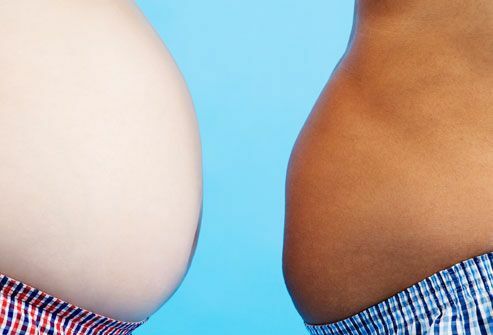 So having more muscle helps to melt fat all over, including the belly. The best plan is to make cardio, strength training, and a healthy diet part of your daily routine. Rest your right foot on a step, stair or chair well behind you, with your weight on your bent left leg. Keep your head up, eyes forward, and weights at your side. Very important: Keep the front knee directly over the ankle. Now, slowly lower your hips by bending the front knee. 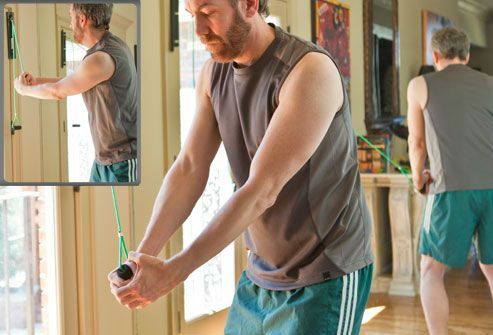 Push back up and pull the weights up towards shoulders, but don't twist the arms as you lift. Do all reps and switch legs. Strong hamstrings help power your legs. To challenge these muscles, lie with knees bent at a 90-degree angle and both heels on a chair or stair. Cross one ankle over the opposite thigh just above the knee. Now raise your hips as high as you can and keep your back straight -- do not arch. Pause at the top and slowly lower hips back to the ground and repeat. Switch legs. This simple move tones the backs of the arms. Sit on the edge of a step or chair, palms on each side, and knees bent to 90-degrees. Now, move your hips forward, off the step, until your hands are supporting your weight. Slowly lower your body, keeping your back very close to the step. Bend the elbows until you upper arms are parallel to the floor. Slowly push back up and repeat. To really challenge triceps, position two chairs facing each other. Sit on the edge of one, palms on each side of your hips. Straighten your legs and prop up your heels on the opposite chair. Scoot down until you're supporting your weight on your hands. Slowly lower your body by bending your elbows until upper arms are parallel to the floor -- and keep your back close to the chair behind you. Slowly push back up and repeat. Looking to trim your waist? Your best bet is to work on slimming down all over with a healthy diet and plenty of exercise. 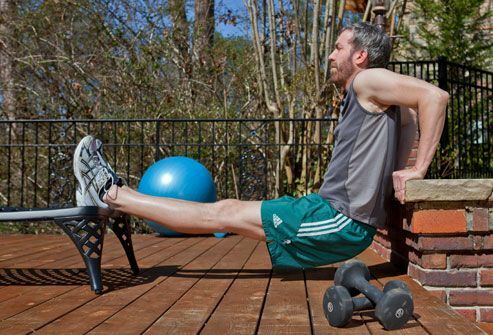 You can work on strengthening your core muscles with moves such as wood chops or planks. This move strengthens all the core muscles, helping to tone the mid-section. Lie on your stomach, elbows close to your sides and directly under your shoulders, palms down. Using your abs, slowly lift your torso off the floor, keeping your torso and legs steady. Don't let your low back sag and don't hike up your hips. Hold this position for 15 seconds or more -- and don't hold your breath! 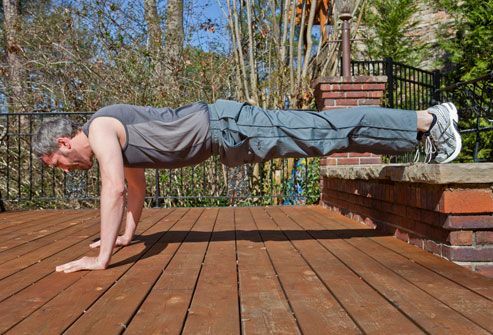 Try this advanced move only after mastering the traditional plank. 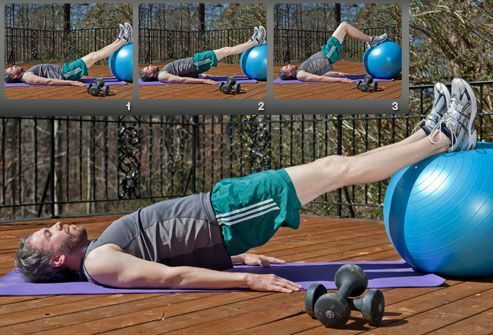 Support your weight with chest and forearms on top of a fitness ball. Keep legs straight and toes on the floor and contract the abdominals to help stay balanced. Shift your weight to your left leg as you bend your right knee and bring it up to meet the ball; slowly return it to starting position and repeat. Switch legs. 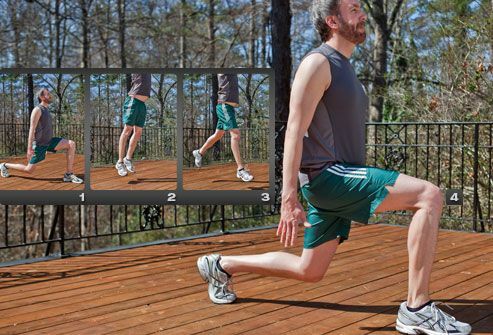 A slightly easier hamstring challenge uses two legs. Lie on the floor with heels and ankles on a fitness ball. Dig your heels into the ball and raise your hips as high as you can, while keeping your back straight -- do not arch. Now bend your knees to a 90-degree angle and roll the ball toward you. Pause at the top and slowly lower hips back to the ground and repeat. Ready to work every muscle in your body? This move comes close, with a special challenge for the core. Put your chest, stomach, and hands (with weights) on a fitness ball, legs straight to the floor. Slowly raise one arm behind you, toward the ceiling. Contract your abs to keep from rolling off the ball, but don't forget to breathe. Pause, slowly return your hand to the ball, and repeat with the other arm. If you have low back pain, warm up by gently stretching your hips before working out. Kneel down on one knee with that foot trailing behind you. Keep your legs parallel to each other, hands on the bent knee, and let your hips sink forward to the floor. Don't lean forward. Your knee can reach beyond your ankle to put less strain on it. Hold for 30 seconds and switch legs. Got a desk job? 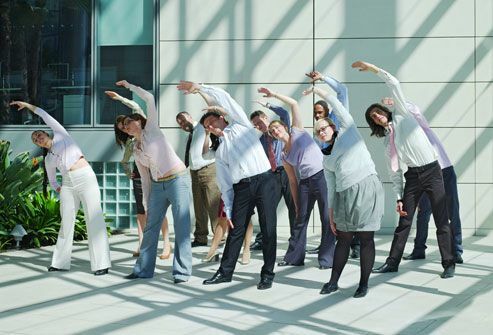 Get up each hour and move a bit, even if you're just walking around the office. Watch your posture -- your ears, shoulders, and hips should be in line. Gentle stretching can also help you feel better after spending all that time at your desk. How Many Reps Are Right for You? For strength and power, aim for three sets of six reps. For general muscle growth and toning, try three sets of 6-12 reps. If you're striving for muscle endurance, plan on two to three sets of 12 or more reps with 30-second rest periods. Remember, if something doesn't feel right, stop and check with a fitness expert. Depending on your health and physical condition, some exercises may be better for you than others. American Council on Exercise: "Plyometrics: Controlled Impact/Maximum Power," "Performing a Push-Up." Baechle, T. Essentials of Strength Training and Conditioning, Human Kinetics Publishing, 2008. David Geier, MD, director of sports medicine, Medical University of South Carolina, Charleston. Page, P. Strength Band Training, Human Kinetics Publishing, 2005. Pete McCall, MS, exercise physiologist, American Council on Exercise.